You've got to work with your files, and you've got to be able to take them on the road with you -- but you're worried about security! After all, if the information that's contained in your files ever fell into the wrong hands...well, let's just say that the future history of Western civilization itself would be rewritten in ways no one could have ever foreseen. Better take steps to protect those files with Secure My Files! 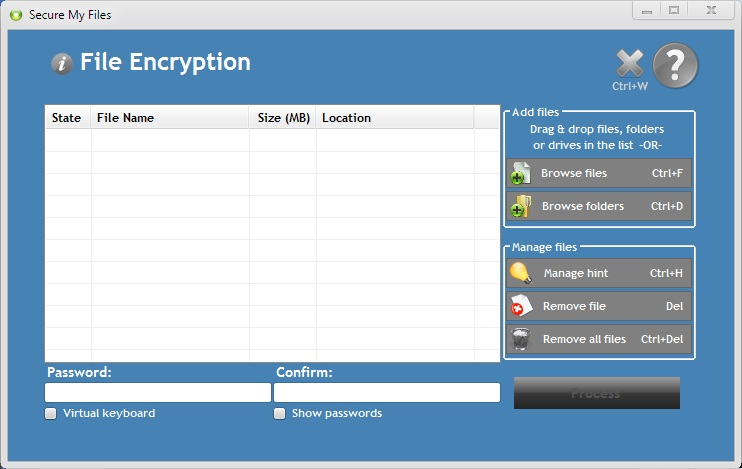 Secure My Files lets you encrypt your files in seconds using strong AES 256-bit technology. In fact, Secure My Files even lets you create secure portable bins that are password protected, but still flexible enough to go with you! Your USB flash drive? 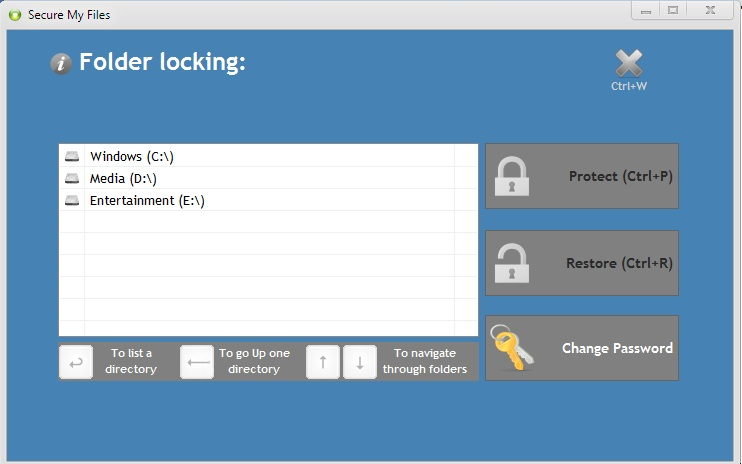 Totally protected by Secure My Files, which gives you the power to encrypt and decrypt your USB drive using any computer, anywhere. Thanks to the power of parallel processing and multithreading, you'll never notice any lag when you're encrypting and decrypting using Secure My Files. Just sit back and enjoy a simple and intuitive interface that lets you lock folders down with just a single click of your mouse! Secure My Files is peace of mind for all of your sensitive information. After you purchase Secure My Files it may be used indefinitely. Secure My Files is licensed per computer, and not per user. Does I need to have administrators rights to open the portable bin from an usb stick ? Does it need to install some files or create some registry keys on the host computer if running from an usb stick ? Vicentiu Bacioiu Hi. I am Vicentiu from SecuSimple, and I am glad to answer your questions. First of all, when using Secure My Files, portable bins, or USB encryption, you do NOT need administrator privileges. Also when you extract a portable bin on another computer, or encrypt/decrypt your USB on another computer, NO registry keys / hidden files are stored on that computer. Only the files that you extract specifically on the hard drive will be stored. Also you don't need a license key to encrypt/decrypt the USB or extract secure bins when using another computer. Genie au Travail Thanks very much for the answers. I'm interested for purchase a licence. Can I edit and save a file directly from within a portable bin (without having to extract it) ? Vicentiu Bacioiu Hi. 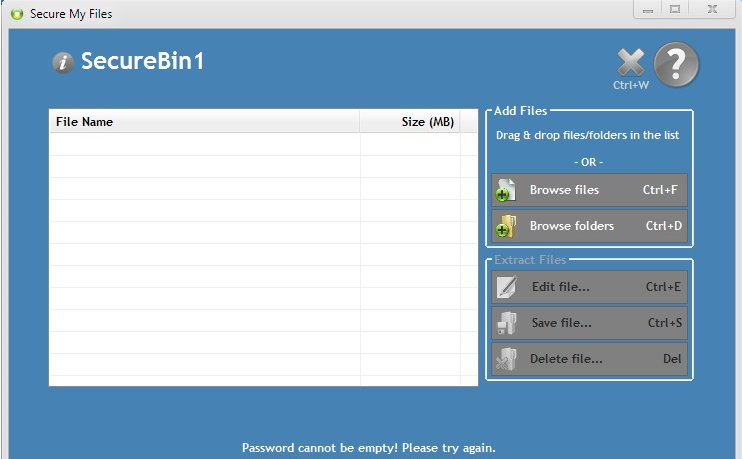 When you open portable bins with Secure My Files, you can edit files on the fly, add, save or delete individual / multiple files. When you take your portable bin on another computer without Secure My Files, you can only extract it. Lupke Brother What happens with the original file when it is encrypted with secure my files? Is it kept, erased or shredded? Nico Westerdale Guys due to circumstances beyond our control we've had to reduce te discount. Appologies from us. Dean User Hi, I wanted to check out your site before buying, but it appears to be down? I can't access it via the link on this page or through the links on Google. I've tried using FF & IE to see if it's a browser prob, but no joy! Any ideas? Vicentiu Bacioiu The original file is deleted and the new file is written. Stan @Nico Westerdale: You wrote: "Guys due to circumstances beyond our control we've had to reduce te discount. Appologies from us." I bought a license with the old (wrong) discount. Will the license be valid? Vicentiu Bacioiu Yes, of course. The license will be valid. We had to change the discount, due to applied fees and taxes, that were causing a loss from our part on every sale. Sorry for the inconvenience. For more licenses, you are getting a bigger discount. Dean User Ok thanks, one more thing... on BDJ deals of the day page it says the deal is 50% off $4.99, but when I go to buy it says $7.99! What is the deal 50% or 20% off? Thanks. Stan @Vicentiu Bacioiu: Thank you! Peter B. The license information is still correct? Lifetime license with free upgrades for life? Vicentiu Bacioiu Yes, all licenses are LIFETIME with FREE UPGRADES. You can choose multiple licenses on Avangate secure page, and you will get a bulk discount. For example if you want to use your license for 2 or 3 PCs. bvssunnydale Hi, I go thru a few computers a year (I'm a tech) but have no problem with the non-concurrent policy. Is there a way to deactivate this on computer (A) before transferring to computer (B). Thanks. Vicentiu Bacioiu Yes, contact our support team, and we'll do this for you (free of charge of course). Our average response time is 2 hours, everyday. This situation also occurs when you re-install your OS, and you need to activate the license again. We will be glad to help you. J Pieper I just tried to purchase more than three licenses and my order reverted to only three. Is there a greater discount applicable for quantities greater than three? If so, how must we order to receive that discount? Vicentiu Bacioiu Yes, for more than 3 licenses, send us your number of licenses at support secusimple.com. We'll offer you the best price.